Understanding in noise and over distance with Roger™ makes life more engaging. Both Zagat1 and Consumer Report2 surveys reported excessive noise to be the top complaint diners have. A cause for increasing noise pollution can be contributed to the interior design of the venues, such as hard surfaces, high ceilings, exposed ductwork, and open rooms. When noise effects the signal-to-noise ratio (SNR), speech understanding becomes challenging. 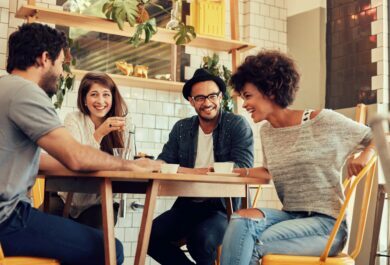 If individuals without hearing loss are experiencing difficulties hearing and communicating in our noisy world, this challenge is multiplied for those living with hearing loss. Although hearing aids are designed to improve hearing and understanding when noise is present, listeners may need something more to boost their hearing and communicate effectively. As an individual living with hearing loss, this is true for me. I find myself having more difficulty understanding in restaurants, even with my hearing aid and cochlear implant on. I am concentrating so intently on the conversations around me that I barely have the chance to enjoy my meal. Hearing from a distance is an additional hurdle to overcome for those of us living with hearing loss. The intensity of a sound decreases as the distance from the source increases, while the ambient noise level of the room remains constant. Speech intelligibility worsens with increasing distance between the speaker and the listener. A common situation is meetings in the workplace. In meetings, colleagues may all speak at once, secondary conversations add to the surrounding noise, and the distance between you and someone at the other end of the table adds to the challenge. Presentations and training sessions put more distance between you and the speaker, and these sessions become difficult if the speaker walks around and faces away from you. How do we overcome this barrier of communicating in noise and over distance? How can I visit this hip restaurant on a Saturday night and communicate with my friends? How can I also attend meetings at work and understand the presenter walking around the room? This is where Phonak’s wireless microphone technology, Roger, comes into play. Roger is designed specifically to improve speech understanding in noise and over distance. Roger is an adaptive digital wireless transmission technology using 2.4 GHz band. The audio signals are digitized and packaged in very short digital bursts of codes and broadcasted multiple times at different channels between 2.4000 and 2.4835 GHz. Roger employs adaptive frequency hopping, meaning only free channels are used. With frequency hopping and repeated broadcasting of codes, interference issues are avoided and end-to-end audio delay is minimal. With hearing aids and/or cochlear implants, Roger allows for low-delay and reliable broadband audio broadcast between the microphones and receiver functionality. Roger offers a wide audio frequency bandwidth, from 200 Hz to 7300 Hz, allowing for exceptional sound quality. Even further, automatic features make the management and use of Roger systems easy. Privacy is also guaranteed. Roger uses a network ID so only devices within a network can communicate with each other once the receiver functionality and transmitters are connected to the same ID. Thus, multiple Roger transmitters can be used in a room with no concerns of interference occurring, such as in a classroom. Roger offers improved SNR to obtain greater levels of speech intelligibility using an adaptive speech-in-noise algorithm. The Roger receivers continuously adapt their output gain according to the ambient noise level in which the Roger system is being used. In very challenging noise environments, additional gain is applied to better hear the Roger signal. At the same time, adaptive beamforming occurs to suppress excessive noises from the left and right sides simultaneously, enhancing the focus on the speaker of interest. This advanced dynamic behavior has led to significant improvements in speech recognition in noise, especially at higher noise levels common in everyday life. 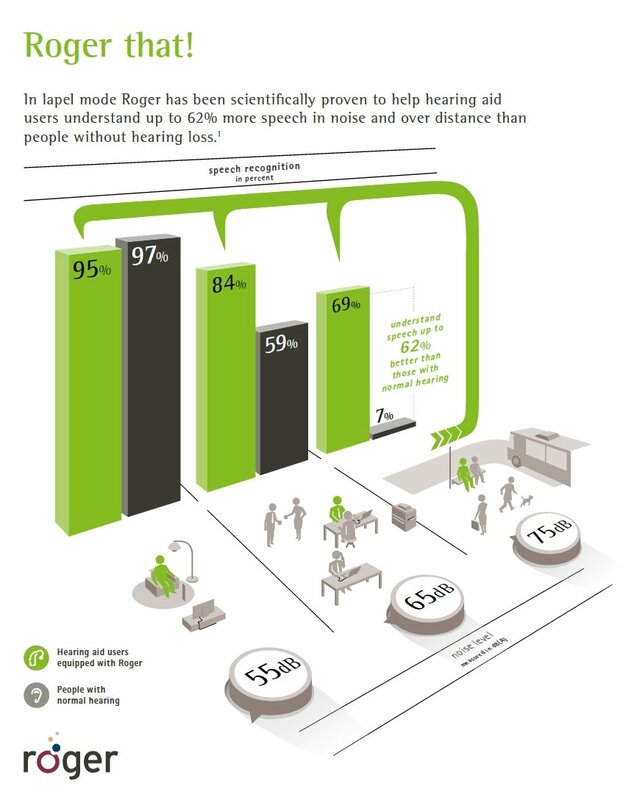 In fact, a study showed that at the 75 dB(A) level, individuals living with hearing loss achieved 69% accurate word recognition compared with only 7% by those with normal hearing.3 The improved SNR obtained with Roger allowed for listeners to hear better in noisy places than those with normal hearing. So when visiting that restaurant on a Saturday night with friends or attending meetings at work, I bring a Roger microphone with me. With a Roger microphone, I am more confident in my abilities to communicate with those around me. With greater confidence in hearing and understanding, I become more engaged in conversations. Roger technology is versatile and can be used in a variety of settings. It is the digital standard that bridges the understanding gap of listening in noise and over distance. For further learning, Jacqueline Drexler offers insights into who can benefit from microphone technology in a previous blog post. 3 Thibodeau, L. (2014). Comparison of Speech Recognition With Adaptive Digital and FM Remote Microphone Hearing Assistance Technology by Listeners Who Use Hearing Aids. American Journal of Audiology, 23, 201-210. You liked this article? Then give it a (5)! Jacqueline received her Doctorate of Audiology from the University at Buffalo. 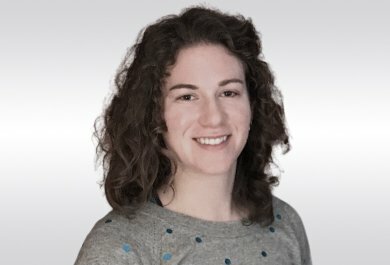 She joined Sonova in 2017 for a one-year formal development program. During that time she worked at Unitron US, Connect Hearing Canada, Advanced Bionics, Phonak US, and Phonak HQ. She now works at the Phonak Audiology Research Center (PARC) at Phonak US.